Sometimes I wonder if there's something wrong with me. I'm 42 years old, and I can't listen to this without getting chills. Every time. I grew up listening to (and sometimes living through) Bruce Springsteen. I loved The Wild, the Innocent and the E Street Shuffle , Born to Run, and the huge live triple-album that came out in 1986. I also always loved Prove it All Night and Badlands, but for a long time I largely dismissed Darkness as too slow, too serious, and not as much fun as Born to Run. And Darkness is a more difficult album in terms of its tone and subject matter. 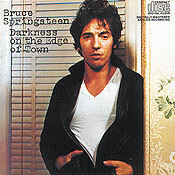 I'm pretty sure it was rock critic Dave Marsh who once wrote that "Born to Run represents the dream; Darkness on the Edge of Town represents the reality." As a 16-year old just discovering the Boss' music, the energy of the early albums perfectly reflected my naive, idealistic exuberance. I just wasn't ready to recognize that Darkness captures, better than any other record I can name, captures the delicate tension between despair and hope that characterizes life in modern America. And yet, for all that has been written and said about this masterpiece, I've really never heard anyone address what I feel is the album's most significant musical paradox - innocence vs. adulthood. Lyrically, the songs chronicle characters who struggle from day to day, struggle to survive, struggle to find hope in a bleak existence. These characters are adults who face adult problems and adult disappointments. Musically, however, almost all of the songs ("Adam Raised a Cain" stands as a notable exception) on the record feature an almost childlike, magical quality. The crystalline piano tones and shimmering glockenspiel chimes dust songs like "Something in Night." "Badlands" and "Candy's Room" with a layer of exuberant, youthful optimism that threatens to burst through the thick tension sitting just above it. The lyrics may set the songs in the dry, dusty, heat of August in the Utah desert. But the record sounds exactly like Christmas-time - no matter what the weather outside, I can smell the crisp December air, see the light snowflakes floating downward, and best of all, feel the excitement and anticipation in my gut. It's a visceral reaction that can cut through moods, disrupt reality. Another key element on the record, of course, is Clarence Clemons' playing - on this album, he does some of his most memorable work - the solos are anthemic. I recently watched "The Promise ," and was astounded to discover that Clarence only plays for a minute or two on the entire album. I guess, on some level, I had known that, but his presence is so tremendous on his songs that he leaves a giant-sized imprint on the experience. Take "The Promised Land" - a song about struggle and the fear that dreams will never come true - but Clarence arrives on the scene, just in time, with a mighty voice that lifts the listener right out of the struggle and toward transcendence. It's the massive contrast between sound and subject matter that create this sense of liberation. Check out this live performance of the song, and I'm sure you'll hear (and feel) what I mean: 1980 - Capitol Centre - Promised Land.